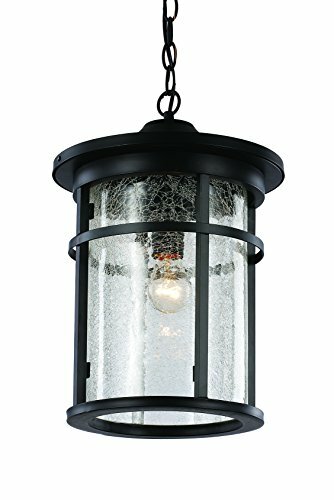 Trans Globe Lighting 40386 BK Outdoor Avalon 16" Hanging Lantern, Black | Fountain City Art Ctr. The Avalon Collection is the perfect addition to any outdoor horizon or canopy. The 16" hanging lantern brings ambient lighting to an overhang area without occupying any usable space. The quality craftsmanship is inspired by Transitional design themes and can complement a variety of exterior styles. It has a round, clear Crackled Glass shade that is housed in a durable cast aluminum frame. The matching roof features a simple awning detail around the rim. Bulb Type: Incandescent. For Outdoor use. Has adjustable dimensions. Chain length: 36 inches. This item is ok for vaulted ceilings. Type of glass is Crackled. The materials used are: Metal, Glass, Electrical. The Finish is Black. Bulb base is E26. The bulb is not included. This item is dimmable. The bulb shape is A19. Wet listed. Warranty details: One year limited Warranty.